Decades ago, some of you may have watched a Sesame Street cartoon where a man in the desert says Agua! Agua! as he looks for water. Well, it's been like that for Mars scientists for years. They've been looking for water in the Martian desert but couldn't find it. 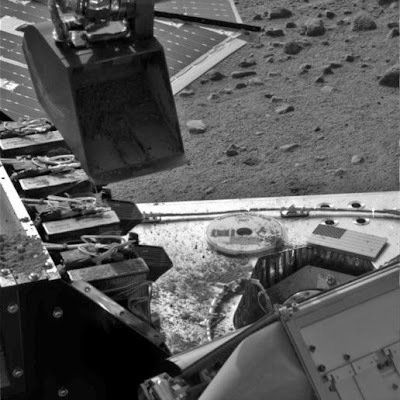 But, now that they have the Phoenix Mars Lander in the Martian arctic plain, they have the tools needed to see if there really is water on the red planet. When the news on ice sublimating from the trough made in the Martian soil came out, people hoped for the best. Firstly, that it was water ice. Water on Mars would answer a lot of mysteries, like landscape features thought to have been made by water action in the past. Now that the NASA has just announced that the robot is about to deliver Martian soil to its wet chemistry laboratory, scientists and laymen alike have their fingers crossed. Another major thing scientists hope to find is organic matter, which will up hopes in finding microbial life on Mars. Click here for a video on the Phoenix Lander.